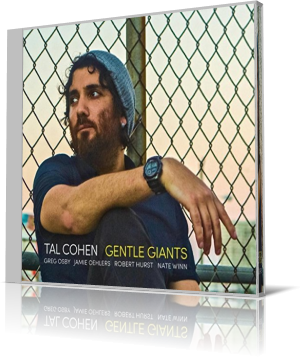 Pianist Tal Cohen bridges jazz with classical on Gentle Giants (Inner Circle Music, 2017). In session with Cohen are Greg Osby, alto saxophone; Jamie Oehlers, tenor saxophone; Robert Hurst, bass; and Nate Winn, drums. Often when paired horns lead a jazz song, it’s two instruments from different families, such as a trumpet or trombone (brass) and a saxophone or clarinet (woodwind or reed). Two saxes bring a different dynamic, as Osby and Oehlers blend or overlap. That pairing launches “Great PK (for Shuli),” an upbeat jaunt. With Hurst and Winn digging it in the background, the middle section features a series of solos by Cohen, Oehlers and Osby. Each goes to town by a different path, enjoying all the scenery. In the liner, Cohen explains that the song is dedicated to his sister, Aviv, whom he calls “Shuli.” The “PK” refers to their friend, PK the Dog, an odd mix of Dachshund and golden retriever. Oescher has the reins to carry the theme of “Legacy.” Cohen says he wrote this when studying with trumpeter Terence Blanchard, who gave Cohen an exercise. Cohen had to write a complete piece in an hour or less. He recorded himself improvising, listened back to it, then took fragments of the improvisation and connected them to create the melody. It’s a moderately paced piece wherein all instruments figure prominently, though the alto leads much of the way. Winn, rather than a steady rhythm, mixes tom rolls, cymbal splashes, snare strikes and subtle pings during Cohen’s middle solo. The passage begins quietly, but gradually swells with intensity. A brief return to the melody and a downshifting pass bring the song to a close. Australia-born Cohen is now based in the United States. His debut release as a leader was Yellow Sticker in 2013. His career has included associations with Blanchard, Joe Lovano and many others, including the musicians accompanying him on Gentle Giants.